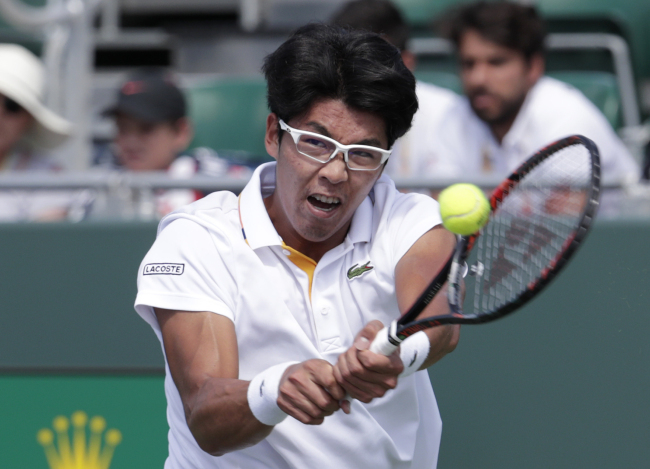 Korean Chung Hyeon has crashed out of an ATP Tour quarterfinals in Miami. The 23rd-ranked Korean was eliminated in the final eight at the Miami Open in Miami, Florida, on Wednesday (local time), as the 17th-ranked John Isner beat him in straight sets, 6-1, 6-4, in 67 minutes. Chung was making his sixth straight quarterfinal appearance on the tour. Isner, known for his powerful serves, recorded 13 aces, against Chung's three, and improved to 3-1 all time against Chung. The Korean committed four double faults, while Isner didn't have any. The American had his way with Chung all day and took the opening set handily at 6-1, as Chung struggled to return his serves. The two were tied at 2-2 in the second set, but Chung had two double faults to fall behind. The Korean failed to break Isner once in this match. Despite the loss, Chung is likely to crack the top 20 in the world rankings for the first time. No Korean tennis player, male or female, has been ranked higher than the bespectacled 21-year-old, who was in 58th place on Jan. 1. The Miami Open is a Masters 1000 tournament. The Masters 1000 series is the third-highest tier of ATP tournaments after the four Grand Slam events and the season-ending ATP Finals. Players earn more ranking points at these events than the 500 series and the 250 series tournaments.